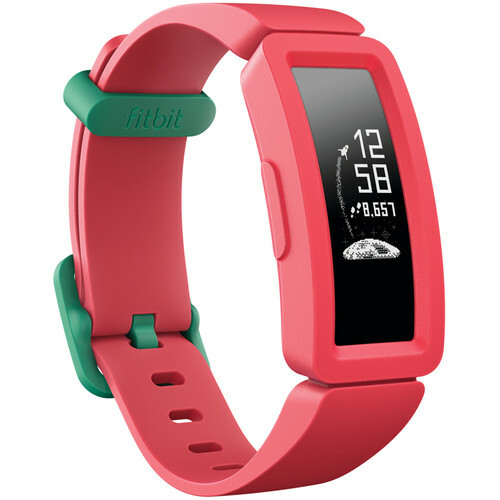 Hey mom and dad, with the Fitbit Ace 2 Kids Activity Tracker you can get a helping hand in teaching your kids healthy habits that can last a lifetime. The Ace 2 is designed specifically for ages 6 and up, with some unique tracking and motivation abilities they are sure to enjoy. The CDC recommends 60 minutes of daily activity for kids, so the Ace 2 features a daily 1-hour active minutes goal. Also, fun badges, trophies, and avatars can be earned to provide a regular source of motivation. In addition to tracking activity, the Ace 2 tracks sleep habits during the night. There's even bedtime reminders and silent alarms to help with time management. During the day, kids can receive notifications from their smartphones, so they can stay in touch with friends and be accessible to you. The Ace 2 does all of this and more, but always keeps you in control with a full set of parental controls. With up to 5 days of battery life and 50m swimproof water resistance, the Ace 2 can be an all-day cool companion for your kids and a helpful assistant to you. The Ace 2 can remind your kids to move and stretch their legs based on settings you control. Throughout the day, the Ace 2 tracks every step, skip, and jump as your kids progress to the CDC-recommended 1-hour active minutes goal. A goal that you can also customize in the Fitbit app. Virtual badges, trophies, and avatars can be earned as kids complete challenges and reach milestones. Parents, you can set up a family account and setup individual accounts for each of your children. In this account, you can view your kids' activity progress, change settings, and approve social connections. In Kid View, your kids have access to an on-screen dashboard to see stats, badges, clock face options, and goal celebrations. The Ace 2 gives kids the ability to personalize their tracker's touchscreen with a variety of different clock faces. Some of them even feature cool animations. Using Bluetooth LE, you can pair the Ace 2 to your kids smartphone. The Ace 2 supports hundreds of iOS, Android, and Windows 10 devices. Once paired, your kids can get call notifications from you and their friends. You can set bedtime reminders and silent alarms that gently vibrate the Ace 2 to wake your children for a new day. While they're sleeping, the Ace 2 tracks their sleep to let you know if they are getting the rest that they need. The Ace 2 features 50m of water resistance, so it can withstand everything from spills and splashes to a shower or playing in the pool. The silicone band is designed to feel comfortable against the skin for long periods of wear, and the strap is fully adjustable. Interfacing with the Ace 2 is meant to be extremely easy to learn and easy to use. There's just the backlit, greyscale OLED touchscreen display and one physical button.